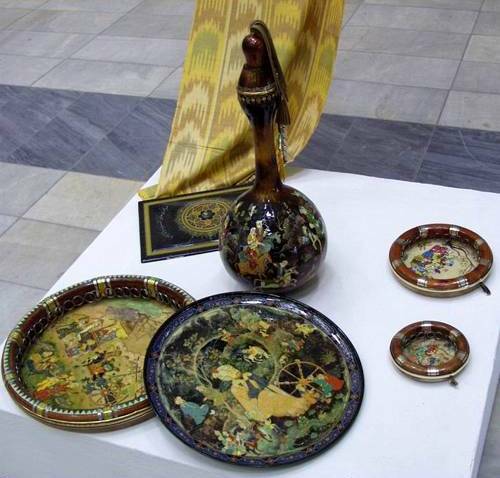 Ceramic for many centuries has been the most highly developed kind of trade in Central Asia. Slip and not slip ceramics of the leading centers had local features, appearing in peculiarity of forms, ornamental décor and colour. Traditional centers of ceramic, which remained till today, are: Rishtan, Gijduvan, Khiva, Samarkand, Gurumsaray, Shakhrisabz, Urgut, Khorezm and Tashkent. In recent years historically formed centers of ceramics have been revived, the assortment of ceramic products is enlarged (dishes, drinking bowls, cups, vessels for water and milk, different khums for keeping products), their quality becomes better. The masters, having felt the support from the government, enlarge volumes of production for reaching efficiency and competitiveness of their produce. They approach to keep local peculiarities, restore forgotten forms and images. 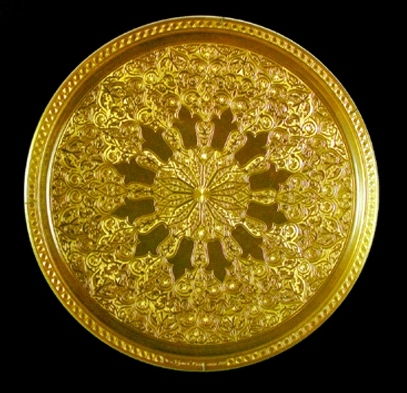 At the same time in the décor of the ceramic handicrafts new ornamental and graphic motives appear. The masters of Samarkand school restore the traditions of vessel decoration by modeled elements in the form of animals and birds heads. In Rishtan the oldest masters and representatives of young generation have brilliant technical skills such as moulding (masters - kuzagars) and painting (masters - nakkoshi). The special feature of Rishtan ceramic – bichromatic colour – was also restored as the secret of the production of famous ishkor glaze, colorant made from plant ashes. Today masters work with effortless ready alkali glazes. 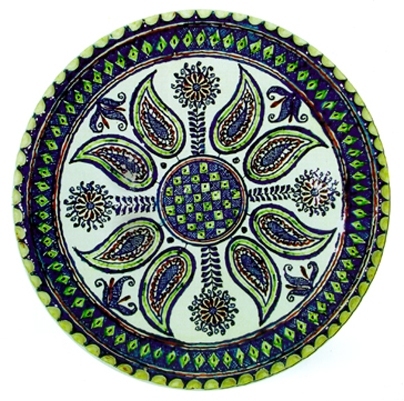 Primarily the décor examples of Rishtan ceramic are: plants, kumgans, symbols of prosperity and sufficiency, knives, birds, fish, elements of architectural décor. The ancient tradition of making figured vessels for water – musalla –in the form of duck, was revived. A remarkable hereditary master A.Rakhimov, the son of the ceramist and ceramic researcher of Uzbekistan M.Rakhimov, works in Tashkent. He makes the dishes in the Temurid and Kashgar style. 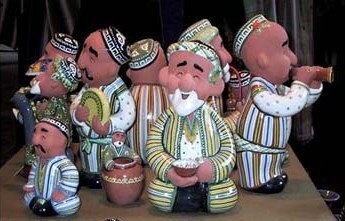 Black Samarkand ceramic. The rich technological art experience of national masters of practically all regions of the Republic is reflected in Rakhimov’s masterpieces. The tradition of making clay toys, an attribute of ancient cultural ceremonies, comes back. 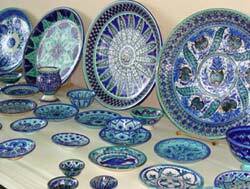 This kind of craft, which was typical for Bukhara and Samarkand ceramic schools in past, almost disappeared.